Montana Fly Fishers has the best guides on the Bighorn! Gourmet lunches and excellent lodging. With Mark's 22 years of experience on the Bighorn and his specialty tied flies, your fishing experience will be one never to forget. Both wade and float trips available as well as half-days. Prices include all flies and tackle. 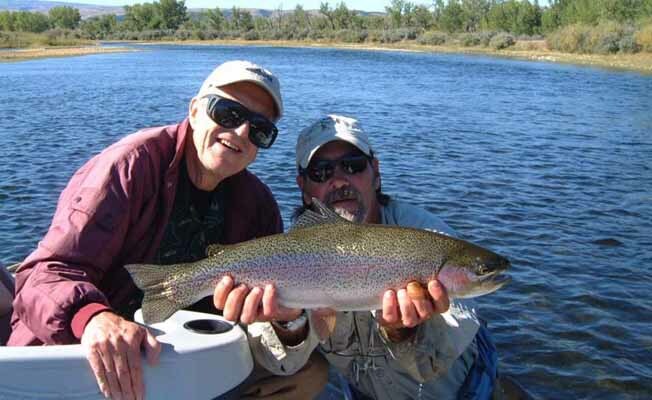 Because of our years of experience in the fly fishing business, each and everyone of our guests will get the personalized service they should expect. After you fish the rest, come fish with the best! From Billings Airport take 27th Street to I-90. Go east and take Sheridan exit I-90 to Hardin, which is about 45 miles away. Take first exit to Hardin, turn right onto Highway 313, and go south for 45 miles to Fort Smith. Take first right in Fort Smith. We are on the corner.From Billings Airport take 27th Street to I-90. Go east and take Sheridan exit I-90 to Hardin, which is about 45 miles away. Take first exit to Hardin, turn right onto Highway 313, and go south for 45 miles to Fort Smith. Take first right in Fort Smith. We are on the corner.